Cyprus has been sprucing itself up for property investors from across the globe in the recent past with significant success. It also has a lot of allure for GCC buyers due to its location and residency options. PW learns more from Michalis D. Zavos and Pantelis Leptos, joint directors of Limassol Del Mar, one of the island’s largest developments. Cyprus hasn’t been on the map for foreign property investment in the past, but this is changing. Besides the citizenship-by-investment programme, what do you believe are the most important reasons? While the citizenship-by-investment scheme and the permanent residency programme are popular with international buyers, Cyprus is attractive to these buyers for numerous other reasons. The island can be reached in just over four hours from London, Moscow and Dubai with frequent direct flights. The country also has a preferable time zone to do business across the globe. What’s more, the Limassol property market has recently become a lucrative investment opportunity. Prices are on the rise, and the country’s recent natural gas boom is pegged to bolster the economy substantially. 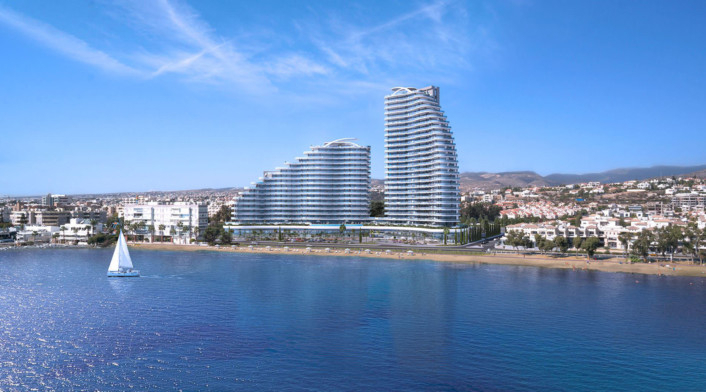 An example of this is the recent sales success we had with our development, Limassol Del Mar, where over 90 per cent of homes in the first two phases of the project have been sold off-plan. What is the special allure of Limassol to invest in a second home? It’s all about the location and the lifestyle Limassol offers. While Nicosia is the capital of Cyprus, Limassol is its beating heart. From chic promenades to ancient monuments, distinct local flavours and the legendary Cypriot hospitality, this is a place where the traditional and the contemporary blend to create a lifestyle unmatched anywhere in the Mediterranean. What are your target groups for this development, apart from Middle Eastern investors? We do not have a target market as Limassol Del Mar has international appeal. Our buyers have come from all corners of the globe. We have seen enquiries from Russia, China, India and the Middle East, among others. Who is funding the Limassol Del Mar development? This is a joint venture between two of Cyprus’s most renowned developers, the Leptos Group and D. Zavos Group. What is the estimated yield of a residence within this project in case it is rented out or utilised as a holiday property? We never speculate on yield figures. However, buyers can, of course, expect a higher yield on their properties if they rent them out on a short-term contract. Besides that, high-quality holiday accommodation is consistently in demand in Limassol. What similar projects are in your company’s pipeline? There are actually a lot of high-end residence projects targeting foreign investors under way in Cyprus. What sets your properties apart? Location, location, location! Limassol Del Mar is located in the heart of a long coastal promenade just opposite the beach. It also has a modern and unique architectural design created by acclaimed British architects Benoy, with every apartment offering sea views and high specifications throughout. Furthermore, there are many integrated services and facilities, including retail, restaurant and leisure space on the ground floor. Can you outline the legal process of purchasing property in Cyprus? Cyprus has flexible property buying procedures in comparison with other countries. People of Cypriot origin and EU citizens have no limit on what they can buy and how many properties they can purchase. A non-EU citizen is entitled to freehold ownership of a villa, apartment or a piece of land of up to 4,014 sq m, whereas international companies can also acquire premises for office space or for residence for their foreign employees. For all of these transactions, the property needs to be paid for in euros. Can you give an indication on how investment in real estate is protected in Cyprus and to what extent foreigners are being taxed for gains from property deals? Properties in Cyprus are subject to capital gains tax at the rate of 20 per cent on the profit from sale. However, the first €17,086.01 (Dh72,894.15) of such profit is exempt from tax for individual owners, while couples who own a property jointly are exempt from paying tax on the first €34,172.03. There is also an allowance for expenses on the property. Cyprus promises fast-track issuance of an EU passport within three months after purchasing a residence. Is this realistic? There have been long backlogs in other EU countries such as Portugal, for example, due to the large number of applications. Yes, the fast-track visas are realistic and we have seen them delivered. The citizenship-by-investment scheme is particularly appealing to global citizens who spend their time between various destinations, as it not only grants the buyer citizenship to Cyprus but also the right for the whole family to obtain citizenship and, therefore, travel to 159 countries. Cyprus also benefits from zero inheritance, wealth, gift and immovable property taxes. The minimum investment to obtain EU citizenship in Cyprus is quite high at €2 million compared with, say, Malta where the minimum investment in property to obtain citizenship is just €350,000. Why chose Cyprus, then? Cyprus’ economy is growing at a faster rate than any of its EU partners other than Ireland, which offers a lucrative investment opportunity to our buyers. The property market is in full recovery across Cyprus, particularly in Limassol, with the recent quarterly price index showing increases in almost all cities across the country, with the biggest increases seen in Limassol. What’s more, the city has an undeniable allure as it is buzzing with restaurants, cafés and bars and is blessed with rich cultural heritage, making it one of the Mediterranean’s premier destinations. Adding to that, the city is home to the region’s best private schools and medical facilities and has stylish marinas and boutique shopping districts, which all provide for an exciting international flair.